Ordinarily, these disks are thought to orbit around the equatorial band (aka. the ecliptic) of a star or system of stars. However, new research conducted by an international group of scientists has discovered the first example of a binary star system where the orientation was flipped and the disk now orbits the stars around their poles (perpendicular to the ecliptic). The hunt for other planets in our galaxy has heated up in the past few decades, with 3869 planets being detected in 2,886 systems and another 2,898 candidates awaiting confirmation. Though the discovery of these planets has taught scientists much about the kinds of planets that exist in our galaxy, there is still much we do not know about the process of planetary formation. To answer these questions, an international team recently used the Atacama Large Millimeter/submillimeter Array (ALMA) to conduct the first large-scale, high-resolution survey of protoplanetary disks around nearby stars. 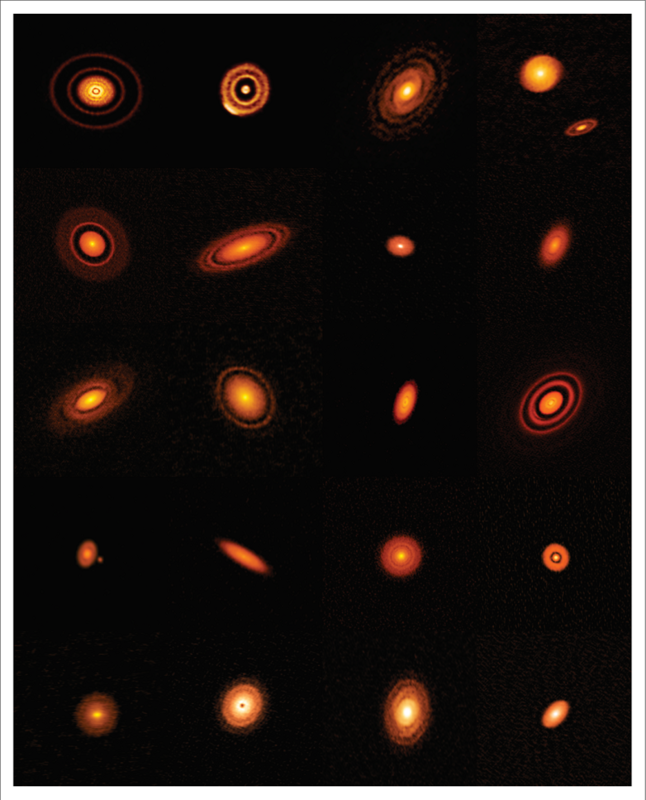 Known as the Disk Substructures at High Angular Resolution Project (DSHARP), this program yielded high-resolution images of 20 nearby systems where dust and gas was in the process of forming new planets. When searching for extra-solar planets, astronomers most often rely on a number of indirect techniques. Of these, the Transit Method (aka. Transit Photometry) and the Radial Velocity Method (aka. Doppler Spectroscopy) are the two most effective and reliable (especially when used in combination). Unfortunately, direct imaging is rare since it is very difficult to spot a faint exoplanet amidst the glare of its host star. However, improvements in radio interferometers and near-infrared imaging has allowed astronomers to image protoplanetary discs and infer the orbits of exoplanets. Using this method, an international team of astronomers recently captured images of a newly-forming planetary system. By studying the gaps and ring-like structures of this system, the team was able to hypothesize the possible size of an exoplanet. The study, titled “Rings and gaps in the disc around Elias 24 revealed by ALMA “, recently appeared in the Monthly Notices of the Royal Astronomical Society. The team was led by Giovanni Dipierro, an astrophysicist from the University of Leicester, and included members from the Harvard–Smithsonian Center for Astrophysics (CfA), the Joint ALMA Observatory, the National Radio Astronomy Observatory, the Max-Planck Institute for Astronomy, and multiple universities and research institutes. In the past, rings of dust have been identified in many protoplanetary systems, and their origins and relation to planetary formation are the subject of much debate. On the one hand, they might be the result of dust piling up in certain regions, of gravitational instabilities, or even variations in the optical properties of the dust. Alternately, they could be the result of planets that have already developed, which cause the dust to dissipate as they pass through it. For the sake of their study, the team used data from the Atacama Large Millimeter/sub-millimeter Array (ALMA) Cycle 2 observations – which began back in June of 2014. In so doing, they were able to image the dust around Elias 24 with a resolution of about 28 AU (i.e. 28 times the distance between the Earth and the Sun). What they found was evidence of gaps and rings that could be an indication of an orbiting planet. These results reinforce the conclusion that the gaps and rings that have been observed in a wide variety of young circumstellar discs indicate the presence of orbiting planets. As the team indicated, this is consistent with other observations of protoplanetary discs, and could help shed light on the process of planetary formation. One of the toughest challenges when it comes to studying the formation and evolution of planets is the fact that astronomers have been traditionally unable to see the processes in action. But thanks to improvements in instruments and the ability to study extra-solar star systems, astronomers have been able to see system’s at different points in the formation process. 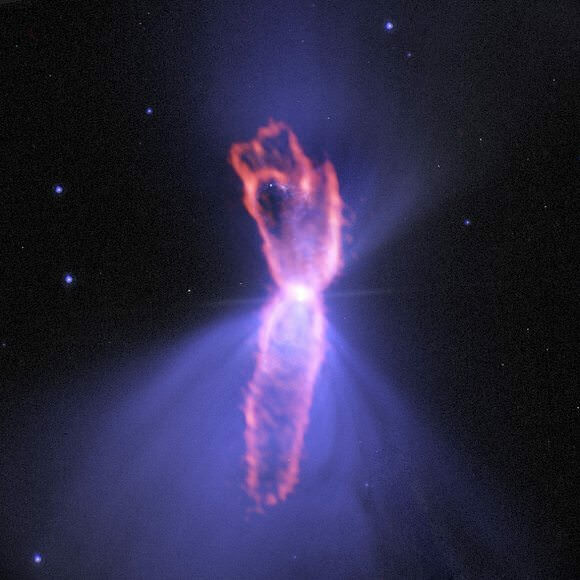 This in turn is helping us refine our theories of how the Solar System came to be, and may one day allow us to predict exactly what kinds of systems can form in young star systems. For decades, astrophysicists have puzzled over the relationship between Supermassive Black Holes (SMBHs) and their respective galaxies. Since the 1970s, it has been understood the majority of massive galaxies have an SMBH at their center, and that these are surrounded by rotating tori of gas and dust. The presence of these black holes and tori are what cause massive galaxies to have an Active Galactic Nucleus (AGN). However, a recent study conducted by an international team of researchers revealed a startling conclusion when studying this relationship. Using the Atacama Large Millimeter/submillimeter Array (ALMA) to observe an active galaxy with a strong ionized gas outflow from the galactic center, the team obtained results that could indicate that there is no relationship between a an SMBH and its host galaxy. The study, titled “No sign of strong molecular gas outflow in an infrared-bright dust-obscured galaxy with strong ionized-gas outflow“, recently appeared in the Astrophysical Journal. The study was led by Yoshiki Toba of the Academia Sinica Institute of Astronomy and Astrophysics in Taiwan and included members from Ehime University, Kogakuin University, and the National Astronomical Observatory of Japan, The Graduate University for Advanced Studies (SOKENDAI), and Johns Hopkins University. The question of how SMBHs have affected galactic evolution remains one of the greatest unresolved questions in modern astronomy. Among astrophysicists, it is something of a foregone conclusion that SMBHs have a significant impact on the formation and evolution of galaxies. According to this accepted notion, SMBHs significantly influence the molecular gas in galaxies, which has a profound effect on star formation. Basically, this theory holds that larger galaxies accumulate more gas, thus resulting in more stars and a more massive central black hole. At the same time, there is a feedback mechanism, where growing black holes accrete more matter on themselves. This results in them sending out a tremendous amount of energy in the form of radiation and particle jets, which is believed to curtail star formation in their vicinity. However, when observing an infrared (IR)-bright dust-obscured galaxy (DOG) – WISE1029+0501 – Yoshiki and his colleagues obtained results that contradicted this notion. After conducting a detailed analysis using ALMA, the team found that there were no signs of significant molecular gas outflow coming from WISE1029+0501. 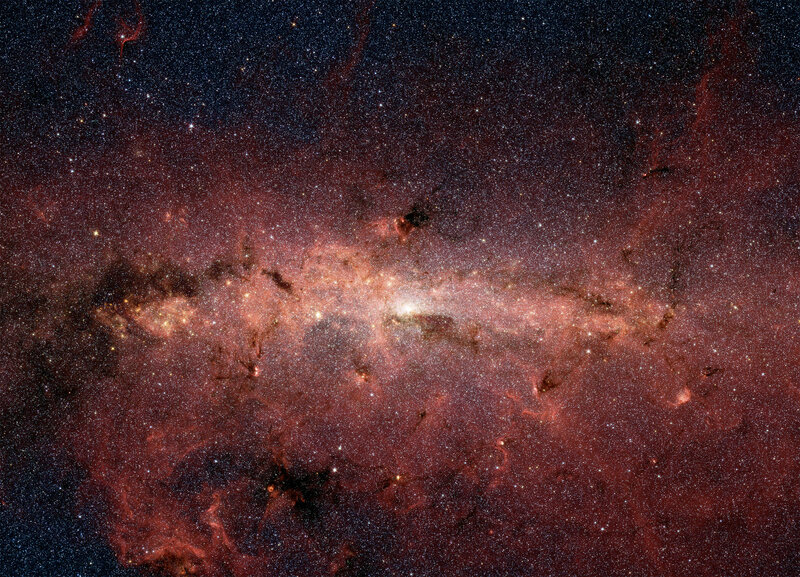 They also found that star-forming activity in the galaxy was neither more intense or suppressed. “[H]as made the co-evolution of galaxies and supermassive black holes more puzzling. The next step is looking into more data of this kind of galaxies. That is crucial for understanding the full picture of the formation and evolution of galaxies and supermassive black holes”. Emission from Carbon Monoxide (Left) and Cold Dust (Right) in WISE1029 Observed by ALMA (image). Credit: ALMA (ESO/NAOJ/NRAO), Toba et al. This not only flies in the face of conventional wisdom, but also in the face of recent studies that showed a tight correlation between the mass of central black holes and those of their host galaxies. This correlation suggests that supermassive black holes and their host galaxies evolved together over the course of the past 13.8 billion years and closely interacted as they grew. The team selected WISE1029+0501 for their study because astronomers believe that DOGs harbor actively growing SMBHs in their nuclei. In particular, WISE1029+0501 is an extreme example of galaxies where outflowing gas is being ionized by the intense radiation from its SMBH. As such, researchers have been highly motivated to see what happens to this galaxy’s molecular gas. The study was made possible thanks to ALMA’s sensitivity, which is excellent when it comes to investigating the properties of molecular gas and star-forming activity in galaxies. In fact, multiple studies have been conducted in recent years that have relied on ALMA to investigate the gas properties and SMBHs of distant galaxies. And while the results of this study contradict widely-held theories about galactic evolution, Yoshiki and his colleagues are excited about what this study could reveal. 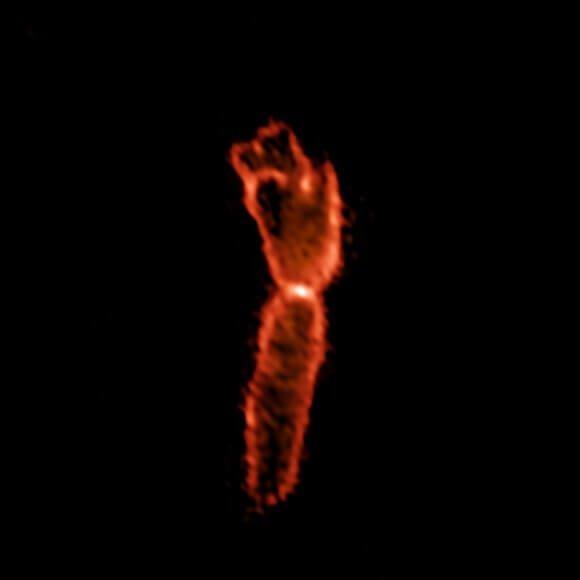 In the end, it may be that radiation from a SMBH does not always affect the molecular gas and star formation of its host galaxy. Proxima Centauri, in addition to being the closest star system to our own, is also the home of the closest exoplanet to Earth. The existence of this planet, Proxima b, was first announced in August of 2016 and then confirmed later that month. The news was met with a great deal of excitement, and a fair of skepticism, as numerous studies followed t were dedicated to determining if this planet could in fact be habitable. Another important question has been whether or not Proxima Centauri could have any more objects orbiting it. According to a recent study by an international team of astronomers, Proxima Centauri is also home to a belt of cold dust and debris that is similar to the Main Asteroid Belt and Kuiper Belt in our Solar System. The existence of this dusty belt could indicate the presence of more planets in this star system. The study, titled “ALMA Discovery of Dust Belts Around Proxima Centauri“, recently appeared online and is scheduled to appear in the Monthly Notices of the Astronomical Society. The study was led by Guillem Anglada from the Astrophysical Institute of Andalusia (CSIS), and included members from the Institute of Space Sciences (IEEC), the European Southern Observatory (ESO), the Joint ALMA Observatory, and multiple universities. For their study, the team relied on data obtained by the Atacama Large Millimeter/submillimter Array (ALMA) at the ALMA Observatory in Chile. These observations revealed the glow of a cold dust belt that is roughly 1 to 4 AUs from Proxima Centauri – one to four times the distance between the Earth and the Sun. This puts it significantly further out than Proxima b, which orbits its sun at a distance of 0.0485 AU (~5% of Earth’s distance from the Sun). Dust belts are essentially the leftover material that did not form into larger bodies withing a star system. The particles of rock and ice in these belts vary in size from being smaller than a millimeter across to asteroids that are many kilometers in diameter. Based on their observations, the team estimated that the belt in Proxima Centauri has a total mass that is about one-hundredth the mass of Earth. The very cold environment of this outer belt could also have some interesting implications, since its parent star is much dimmer than our own. Pedro Amado, who also hails from the Astrophysical Institute of Andalusia, was similarly enthusiastic about these findings. As he indicated, they are just the beginning of what is sure to be a long process of discovery about this system. This study is also likely to be of interest to those planning on conducting direct observations of the Alpha Centauri system, such as Project Blue. In the coming years, they hope to deploy a space telescope that will observe Alpha Centauri directly to study any exoplanets it may have. With a slight adjustment, this telescope could also take a gander at Proxima Centauri and aid in the hunt for a system of planets there. 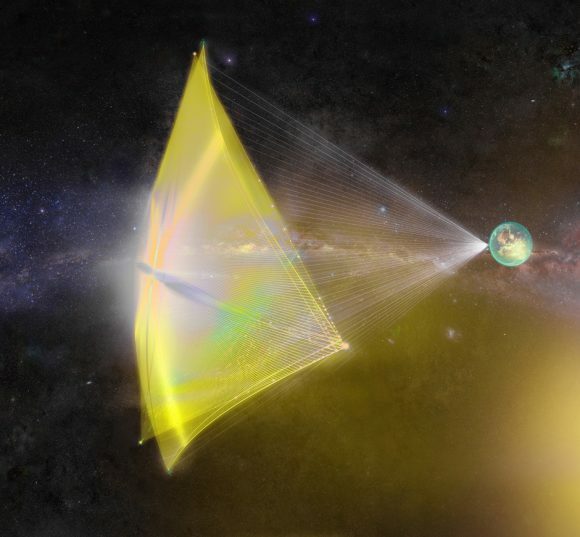 And then there’s Breakthrough Starshot, the first proposed interstellar voyage which hopes to send a laser sail-driven nanocraft to Alpha Centauri in the coming decades. Recently, the scientists behind Starshot discussed the possibility of extending the mission to include a stopover in Proxima Centauri. Before such a mission can take place, the planners need to know what kind of dusty environment awaits it. And of course, future studies will benefit from the deployment of next-generation instruments, like the James Webb Space Telescope (scheduled for launch in 2019) and the ESO’s Extremely Large Telescope (ELT) – which is expected to collect its first light in 2024. One of th most widely-accepted theories is that galaxies changed by merging, where smaller clouds of stars – bound by mutual gravity – came together, altering the size and shape of a galaxy over time. However, a new study by an international team of researchers has revealed that galaxies could actually assumed their modern shapes through the formation of new stars within their centers. The study, titled “Rotating Starburst Cores in Massive Galaxies at z = 2.5“, was recently published in the Astrophysical Journal Letters. Led by Ken-ichi Tadaki – a postdoctoral researcher with the Max Planck Institute for Extraterrestrial Physics and the National Astronomical Observatory of Japan (NAOJ) – the team conducted observations of distant galaxies in order to get a better understanding of galactic metamorphosis. Capturing the faint light of these distant galaxies was no easy task and the team needed three ground-based telescopes to resolve them properly. They began by using the NAOJ’s 8.2-m Subaru Telescope in Hawaii to pick out the 25 galaxies in this epoch. Then they targeted them for observations with the NASA/ESA Hubble Space Telescope (HST) and the Atacama Large Millimeter/submillimeter Array (ALMA) in Chile. Whereas the HST captured light from stars to discern the shape of the galaxies (as they existed 11 billion years ago), the ALMA array observed submillimeter waves emitted by the cold clouds of dust and gas – where new stars are being formed. By combining the two, they were able to complete a detailed picture of how these galaxies looked 11 billion years ago when their shapes were still evolving. Observation images of a galaxy 11 billion light-years away. Credit: ALMA (ESO/NAOJ/NRAO), NASA/ESA Hubble Space Telescope, Tadaki et al. What they found was rather telling. The HST images indicated that early galaxies were dominated by a disk component, as opposed to the central bulge feature we’ve come to associate with spiral and lenticular galaxies. Meanwhile, the ALMA images showed that there were massive reservoirs of gas and dust near the centers of these galaxies, which coincided with a very high rate of star formation. These findings could lead astronomers to rethink their current theories about galactic evolution and howthey came to adopt features like a central bulge and spiral arms. It could also lead to a rethink of our models regarding cosmic evolution, not to mention the history of own galaxy. Who knows? It might even cause astronomers to rethink what might happen in a few billion years, when the Milky Way is set to collide with the Andromeda Galaxy.